This guide is for the first game entitled Fist of the North Star in the Hokuto no Ken series. For other games in the series, see the Hokuto no Ken category. Fist of the North Star, released in Japan as Hokuto no Ken 2 (北斗の拳２ 世紀末救世主伝説, Hokuto no Ken 2: Seikimatsu Kyūseishu Densetsu?, lit. "Fist of the North Star 2: Legend of the Century's End Savior") is a 1987 side-scrolling beat 'em up developed by Shouei System for the Famicom. It based on the manga and anime series of the same name. The game is actually second Hokuto no Ken Famicom game released in Japan and the only one released in North America for the NES. The game is based on the second anime series, Hokuto no Ken 2, and covers primarily the Imperial Capital arc of the series, where Kenshiro faces off against the Gento Kōken fighters. Because the series was still airing when the game was initially made, the game only goes up to the beginning of the Land of Asura arc. The final boss is the Nameless Asura, who was only a minor villain in the series. The North American version was ported by Taxan and released in the US in 1989. It is simply titled Fist of the North Star and should not be confused with the first Hokuto no Ken Famicom game, which was unreleased overseas. 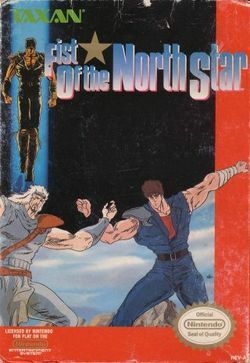 Despite being based on Hokuto no Ken 2, the North American cover depicts Kenshiro fighting against Toki, who appears only in the first anime series. 1 Press to kick continuously without using turbo button. 2 Press to punch continuously without using turbo button. 3 Kenshiro can knock projectiles back to enemies and knock them out. 4 The first time reaching this level, restore hit points to max. 6 Kenshiro can fire projectiles while using the "Bomb" gauge. Hold and press to fire projectiles equal to kicking directly. Hold and press to fire projectiles equal to punching directly (able to drop stars). 7 Kenshiro will break his clothes and gain defense (odd, but true). To pass through a door, you must press + + . Kenshiro and each boss have a total of 56 hit points. Normal attacks do 3 points of damage to enemies, while squatting attacks do 1 point. If you strike a boss' weak point with the right attack as your first attack, you will do significant damage (see below), and able to earn more points. Collect a necklace to make a double image of yourself appear. You will be temporarily invincible, but cannot move between floors. You gain 30 more seconds of time for beating a mid-boss. In the Japanese version, many mid-bosses are only vulnerable on their heads. If you continue on the fifth stage or beyond, you will return to the fourth stage. You can only access the eighth stage by clearing all stages without ever using a continue. Collect the stars/cries by punching enemies to death to power up. However, the black star ("あべし" cries in Japanese version) can only power you up to 4 levels. In order to get more power ups, you must collect white star ("ひでぶ" cries) which can be told by a different crying sound of defeated enemies. In Japanese version, some characters will appear after beating a boss. This does not happen in American version. By choosing "VS start", you can challenge the first four bosses without any mook fights. The names of Killing method are only shown in Japanese version. First attack: Punch to the face. First attack: Punch to the stomach. First attack: Kick to the stomach. First attack: Kick to the feet. First attack: Kick to the face. First attack: Punch to the face during Falco performing sliding kick. This page was last edited on 23 June 2015, at 16:06. This page has been accessed 18,686 times.